This is a great add-in! Thank you! I am in the process of making a small income and expense tracking workbook and had the need to do searchable lookup for account information, payee, bank accounts, etc.. This worked wonderfully but i found there were times when I needed to allow an entry not in the dropdown, like Check Payee. I modified the vba code to check the validation information and based on the validation error type I can display yes / no msgbox prompts to continue to write to cell if error type is information or warning and display error message if the cell must be filled from the list. It uses the validation cell information for the error messages or a default message if the cell information is blank in the validation properties. 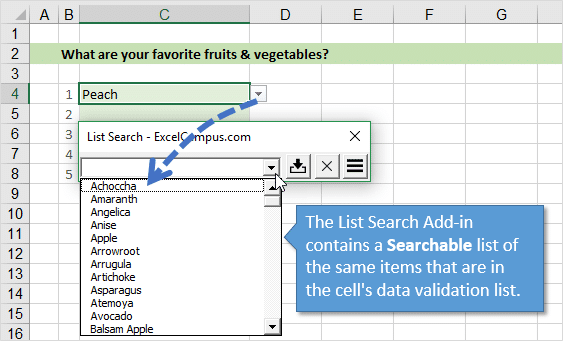 I have also modified the code to display the cell value in the search box if the cell is already populated. How can I add import this into vba so that my co-workers can use it too? Does it also works on dependable drop-down lists? It would be great if it could. Hi Jhon and thanks a lot for this add-in! I imported the List Search form in the VBA of a workbook, and the worksheet I have the validation list is usually protected. Is there a way to prevent the form from loading (when I click on a cell) when the worksheet is protected and enable the loading (when I click on a cell) when the sheet is unprotected? John, Thank you for the List Search. I use it almost every day. 1. Have you ever considered having a function added that re-pastes the previous paste to the next cell? 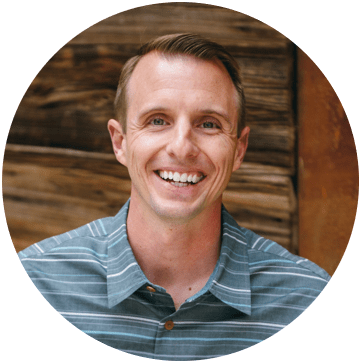 I am currently using your List Search Program to go down a column of expenses for our year-end financials, and there are many rows that require the same choice. I have to close out of List Search and then manually copy and paste the previous search results into the next 1 to up to 20 rows, re-launch List Search, and then repeat. I would love to continue to keep hitting the enter button, and a repaste auto happens. 2. Is there a way to assign a key to auto-launch List Search. Let me know your thoughts. Thank you again! Data validation list entries are all on one line. I am usin German windows and excel. any solution on this problem? I was very pleased to find your site.I wanted to thanks for your time for this wonderful read!! I definitely enjoying every little bit of it and I have you bookmarked to check out new stuff you blog post. I have been searching for something like this for a long time. Great job. I think this should have been developed by MicroSoft! I will find several uses for it. One thing I noticed is that if you try to drop the search drop down in a cell with a validation range relating to a whole column like range A:A, you get an error. No big issue if you know what you are doing but the VBA code may confuse some users. Thank you so much for this helpful add-in. I’ve been looking exactly for something like this. I only have 2 suggestion if you are still updating this. 1. Allow to click on another cell and close the add-in window. 2. There seems to be a bug where after I have gone through a few cells inputting things, when I tried to close the Add-in windows, I have to click “X” a lot of times for it to finally close and be able to click another cell. I am getting an error when attempting to use the List Search add in. Compile error in hidden module : f_ListSearch. information on how to correct this error. I have reinstalled, but still no luck. There is an error with the validation formula. Please fix the error in the Data Validation window. This is a very useful tool except I can’t find out how to toggle it off/close it when it isn’t needed? If I select the Close open it still opens every time I click on a cell with data validation. I have a large table with multiple validation lists and if I click on any of the cells with data validation, I have to close list search before I can do anything else. Thanks for all you do! I realize this is a while after your post, but to toggle the tool off when you do not need it, expand the options bar and click on the second to last button. It is a box with an arrow pointing out the top right. This will turn off auto-open. Hope this helps! For example, original NewPO list was on tab ‘DataMaps’ cell W8 “YES”. This is just a flag and counts new purchase order requests. So I don’t need a “NO” option in the dropdown. YES in the dropdown gave me Type Mismatch errors. When I changed my list to ‘DataMaps’ cells W8:W9, List Search worked. Even though my cell W9 was empty. I’m brand new to this app (as of today) and I realize this is a VERY BASIC example, however I hope this helps someone! The only problem I’m having is the pop-up box for the list search works its way into the bottom of the screen and I can’t look at the options in the search list… so I have to move it after every entry on the bottom of the spread sheet… just to view the results…. Is there a way I can fix it stationary to the top ribbon? or fix it stationary so it doesn’t drift off the page? Thanks for the nice feedback. The add-in attempts to start the List Search Form under the selected cell, but it doesn’t always work. There are a lot of variables here including the screen resolution, multiple monitors, and resize/maximize state of the Excel window. So, I created a version of the add-in that will startup in the center of the screen. You can find this file on the downloads page for List Search when you login to the members area. 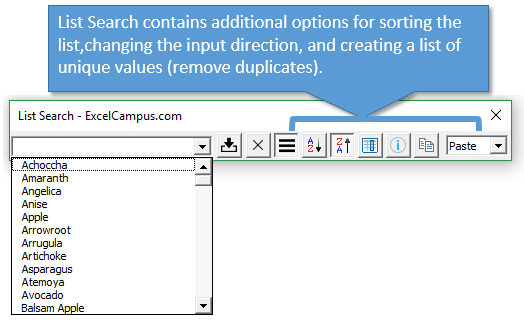 The file is named, “The List Search Add-in for Excel – Startup Center Screen.zip”. Just follow the instructions on how to update an add-in on this page within the members area. Great add-in. One thing that I have found is that if you have set freeze panes in your sheet and the column you want to use the search on is to the left of the frozen column then when the list-search form displays it is over to the right of the frozen column and looks like it bears no relation to the one you want to search. Is there any way around this? I just saw your comment. I don’t know of an easy way around that because there are a lot of variables in trying to determine the startup position of the List Search Form. However, I just added a version of the add-in to the downloads page that will display the form in the center of the screen. See my comment above to Nathan for instructions on how to get it. This will at least put the form in the same position on the screen every time it opens. Sorry a bit newbie here. Which file of the 4 modules is he referring to? I use your code. It is very useful. Thank you very much. I installed the search list add-in yesterday. I liked it. It worked fine. Today I reopen Excel, the add in is not showing, if I go to Excel Options, the add in is there. How can I make it reappear again on my ribbon. Is it working with Google sheet and if not,, is there are any other solutions to have a searchable drop-down list of Google sheets ????? Fabulous tool you have there! Fills a huge gap in Excel functionality. Great work and would be glad to contribute. It’s a great program but is there anyway to permanently leave it open in the ribbon? Just noticed that it doesn’t work with subcategories drop down list. This is a perfect program . It works very well on my computer . But I need to cancell it for small list (for example less than 15 row list ) but it wake up for all list . please sned me a solution . This works great- thank you! I would like to know how to skip to the next row without selecting anything if I don’t find results I want in the list. EG when you select from the search results and click the arrow key it goes to the next cell but what if I don’t want to search in that cell? Is there a way to make is skip down again? That is one amazing ad-in. Is there a way to use this on Mac? I’ve managed to install the add-in and it comes in a new XL Campus tab but when I try using it, excel does not allow me to use mouse and constantly makes error sound even when pressing on empty cells. I recently got Formatting Shortcuts and List Search. I use a number of Excel 2016 properties. They show up in Excel, but now they are blank using (win 10) windows explorer. Any thoughts? Thanks for LIST SEARCH FORM.I use it to fill up my RECIPE COSTING FORM in EXCEL.I have to fill up two column. One is ITEMS and another is QTY.I could fill up ITEM column by LIST SEARCH FORM. But it doesn’t allow me to type in another column, when LIST SEARCH FORM is active. I have to every time ESC it, then fill up the QTY column, after that active it. Would you make it easy please ! i got runtime error and type mismatch notification after go to next cell, that is right cell. I cant believe….it works perfect…such an amazing feature…. cant explain in words..again Mr.Jon thank you very much…. This add inn deserves to be part of the next version of excel.